Be the first to share your favorite memory, photo or story of Pamelia. This memorial page is dedicated for family, friends and future generations to celebrate the life of their loved one. 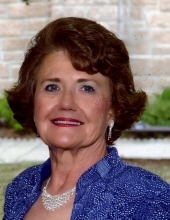 Mrs. Pamelia Kaye Smith Cooke, 67, of Dunn died Saturday evening January 26, 2019 at Wake Medical Center in Raleigh. Pam was born November 3, 1951 in Harnett County daughter of the late Robert Lee Smith, Sr. and Mary Margaret Herring Smith. She was also preceded in death by her brother, Lonnie Wayne Smith. Pam was a 1970 graduate of Dunn High School and received her nursing degree from Lenoir County Memorial Hospital in Kinston. She retired from Cherry Hospital in Goldsboro. A funeral service will be held at 11 a.m. Thursday, January 31, 2019 at Skinner & Smith Funeral Home Chapel with Rev. Gerald Blake officiating. Burial will follow at Memorial Cemetery. Pam is survived by her husband, Larry Ivey Cooke; sons; Larry Scott Cooke and wife Ashley of Greensboro, Bob Cooke and wife Jessica of Ona, West Virginia; grandchildren, Madelyn, Carter, Jackson, George and Oliver Cooke; brother, Lee Smith and wife Lucille of Dunn, sister, Karen Godwin and fiancé Mike Calvo of Dunn and three fur babies. The family will receive friends 10 – 11 a.m. Thursday at the funeral home. To send flowers or a remembrance gift to the family of Pamelia Kaye Smith Cooke, please visit our Tribute Store. "Email Address" would like to share the life celebration of Pamelia Kaye Smith Cooke. Click on the "link" to go to share a favorite memory or leave a condolence message for the family.